Clear statues in front of Mog House area to Auction House. Clear statues in front of Auction House. (Optional) Clear statues to Windurst Woods zone. Clear statues to Shantoto's Manor. Clear statues to Jeuno Consulate, including NM Wuu Qoho the Razorclaw. Use the area in front of Shantoto's manor to fight and the path further southwest to kite statues. Clear statues to Zonpa Zippa's Manor. Clear statues to Toraimarai Canal gate. Statues will spawn underneath the bridge area by aggro of Avatar Icon 234. Clear statues to House of the Hero, including NM Haa Pevi the Stentorian. Clear statues to Yoran-Oran's Manor, including NM Xoo Kaza the Solemn. Clear statues at Koru-Moru's Manor. Clear statues on the bridge to Heaven's Tower. Pull NM Loo Hepe the Eyepiercer from statue at Heaven's Tower entrance. Avatar Icon 337 will spawn Avatar Icons 315, 317, and 319 at the base of the bridge to Heaven's Tower, which may make a sacrifice pull necessary. 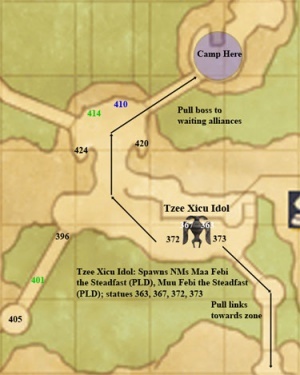 Alternatively, groups can camp at the Heaven's Tower itself and pull the NM normally. Return southwest, clearing statues towards the bridge to Heaven's Tower. 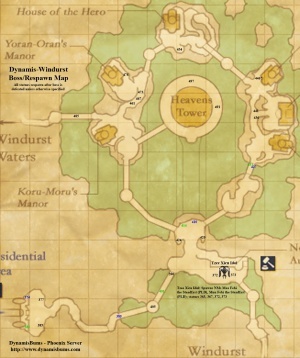 After obtaining the time extension from Manifest Icon 277, groups will avoid statues at Koru-Moru's Manor by following the edge of the path closest to the center, towards Yoran-Oran's Manor. (Optional) Clear statues to Zonpa Zippa's Manor. Return southwest to the bridge leading to Heaven's Tower. Camp northeast of the bridge directly north from the Auction House. A player with increased movement speed aggros (does not pull) and draws away spawned statues, Vanguard, and NMs from Tzee Xicu Idol while another player pulls Tzee Xicu Idol itself from the group back to the waiting alliances. It is possible for the player training away the remaining enemies to drop his hourglass to avoid being KO'd. Defeating Tzee Xicu Idol grants a 30-minute time extension. Vanguard's Crows cast Silencega often. Crows should be Slept and and Silenced away from the main alliances while fighting other Vanguard. To avoid Astral Flow, alliances are split up between meleers that will kill each Vanguard Oracle and the mages that will keep the remaining Oracles and their avatar pets asleep. A puller (PLD or WAR) will choose a Vanguard Oracle to bring back to the alliances. Another mage will cast some DoT on it (eg., Dia) to prevent it from being slept again. If the puller engages their target, the mage can easily /assist to quickly find the target in the group and DoT it appropriately. The process is repeated until all the Vanguard have been cleared. 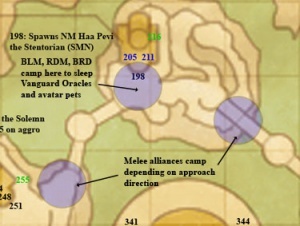 It is important that the melee alliances keep their distance from the mages sleeping the remaining Vanguard, as AoE (eg., Sweep) can cause mages to die or be otherwise incapacitated, possibly preventing an avatar's Astral Flow from being stopped once sleep wears off. 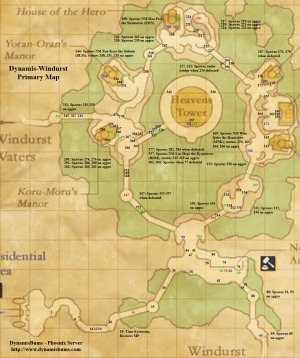 Map and notes for Koru-Moru's Manor here. This page was last edited on 16 August 2017, at 23:00.